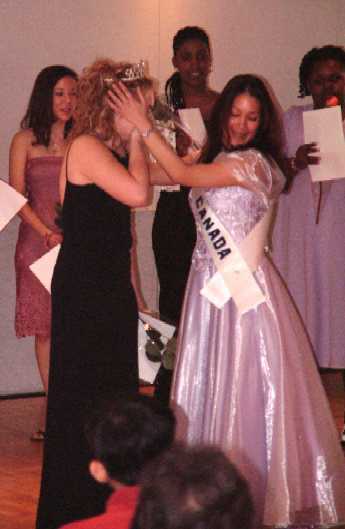 RapSohD presented The Journey Fulfils the Dream, the performing arts competition final for the selection of its Miss Talented Teen Canada 2002, at 2.00 pm, on Sunday May 5, 2002. Supported by and thanks to the Borough Pierrefonds/Senneville, the venue for this event was again the Pierrefonds Cultural Centre, 13850 Gouin Boulevard West, Pierrefonds. A full house applauded as 18 very talented young ladies took their places on the stage of Pomp and Ceremony 1. Under the artistic direction of Mr. Christopher Lester, the audience was led into singing our national anthem O Canada folowed by a rousing rendition of Rodgers & Hammerstein's Climb every Mountain. 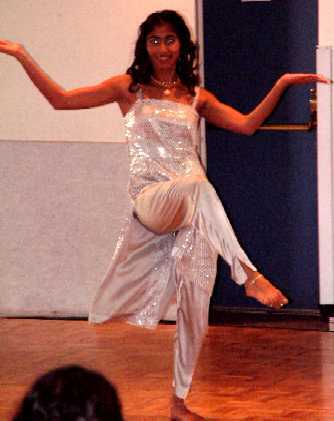 which was performed by the contestants. Entertainment was also provided by a duo of tap dancers from the Ethel Bruneau School of Dance, Some of Soul (SOS), directed by Ms. Sherma Salandy and eleven year old Alyssa Walton. Of course the highlights of the afternoon and focus of everyone's attention included the personality and appearance segments to be judges, followed by the surprisingly excepational performances demonstrated by the competitors. Prior to the announcement of the runers-up and winner, Melina Soochan, RapSohD's Miss Talented Teen Canada 2001, entertained us with a polished, self-accompanied rendition of Amanda Marshall's Beautiful Goodbye. 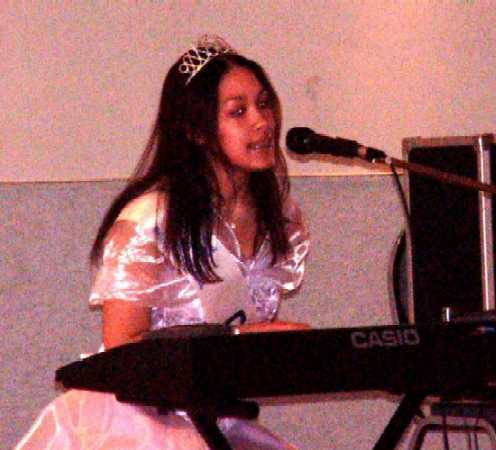 Her farewell was read to the background of Burn Away, her self-composed and self-accompanied winner. Finally it was time for the results of this exciting and close competition. Two sixteen year old contestants, each of whom exhibited excellent talent in different styles of dancing, staked their claim on the first runner-up position. Hailing from Québec, Brossard resident Mila D'Cunha, performed a dynamic and graceful fusion of classical Indian ballet and hip-hop dance, set to a DSNY remix medley,. Challenging with a luxuriantly fluid dance set to James Brown's song This is A Man's World from Ville St. Laurent was Jamila Joseph. However the spotlight would soon turn to a fifteen year old singer and resident from Cornwall, Ontario, who was named RapSohD's new winner, for her magnificently powerful interpretation of the song Testify to Love, by Wynonna. 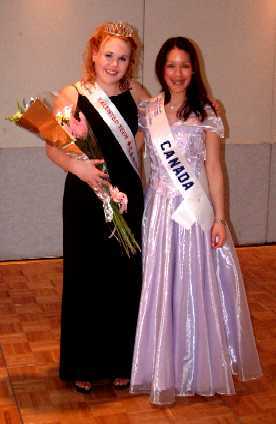 Wearing the full regalia as Miss Hal Jackson's Talented Teen Internaitonal (HJTTI) Canada 2001, Melina Soochan assisted in the official crowning of Vanessa Regnier, as RapSohD's Miss Talented Teen Canada 2002. Best wishes to you, Melina, for continued success and thank you for the admirable manner in whichyou conducted yourself as you represented and will always represent RapSohD and HJTTI. 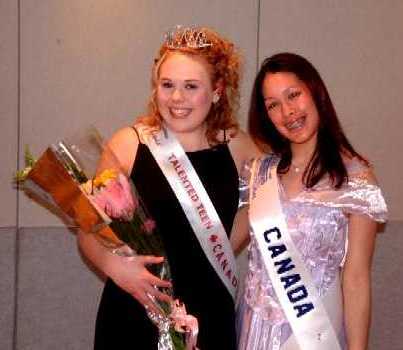 Good luck to our new Miss Talented Teen Canada 2002, Vanessa Regnier, in her participation as Canada's delegate at the 32nd annual Hal Jackson Talented Teens International Scholarship Competition, July 21 - 28, 2002. Our thanks and appreciation are extended to the organizing committee members, volunteers and all who worked tirelessly in different ways to make this year's event a success. Special thanks to the participants, supporters and audience without whom there would not be a presentation. Kudos to Mr Christopher Lester, administrator and co-chairman of the Theatre and Music Department of John Abbott College, who used his artistic expertise to stage the show and to Mrs. Norma Heitner, chairperson of RapSohD for her relentless efforts in making this event a great success.